I thought I should just give you an update on the latest state of putting down the C64. Some time ago, I decided to explore the dark side, by buying a Commodore 128, which is a good computer, but has a demon lurking inside, because one of its modes of operation is C64 compatible. Unfortunately, due to this, most of the software available for it is C64 software, as well as CP/M software and hardly any software specifically for the C128 was ever produced. Recently, I bought an amazing MSX2 computer on eBay! 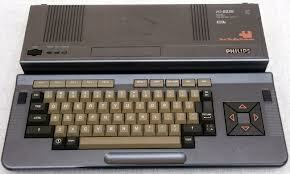 This is a Philips VG8235 MSX2. No MSX2 computers were ever released in Britain, or the USA, but they’re a pretty cool, “souped up” Z80 based computer, a bit like a custom car or “hot rod”. They have a 512 colour palette, often include a built in disk drive, and often contain a lot more than 64K, accessed using both separate video RAM, as well as memory mapped system RAM. Several FM sound upgrades are available, including some modern copies being produced by an online store. I should remind you that the minimum MSX2 spec is at least 64K main RAM (but sometimes supplied with 256K RAM), at least 64K VRAM (often supplied with 128K VRAM), 32K BASIC/BIOS and 16K subROM with MSX BASIC 2.0 or 2.1, Yamaha V9938 VDP video chip allowing SCREEN modes of 0-8, with up to 256 colours on screen at once, or up to 512×212 graphics with 16 colours from a palette of 512, as well as 16 colour multicoloured sprites, and real time clock with rechargeable battery. My MSX2 has been upgraded to 512K. The disks are handled by MSX Disk BASIC commands such as CALL FORMAT, FILES, and KILL , as well as by MSX-DOS, a very professional hybrid of CP/M and MS-DOS, meaning a CP/M system using MS-DOS commands and MS-DOS formatted disks. Mouse based alternatives to this include the classic Cheese and the modern SymbOS http://www.symbos.de/shots.htm?1?1 . 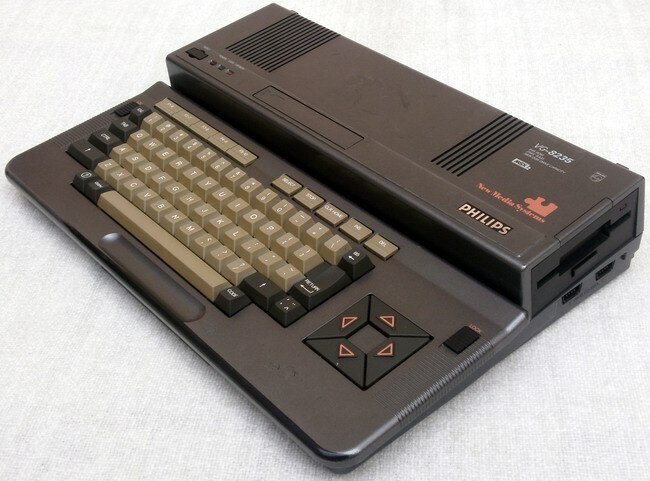 I haven’t yet received my MSX2 computer, but after I do, I hope to demonstrate some MSX2 programming, complete with listings, pics, and maybe even videos. 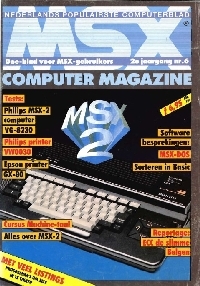 I’m currently reading my way through an archive of the Dutch “MSX Computer Magazine” to see what I was cheated out of. Meanwhile, I’ll continue to read about and program my Raspberry Pi in Scratch, BASIC, and Python. I’d like to take this opportunity to wish you a Happy Christmas, free of C64 PEEKs and POKEs!